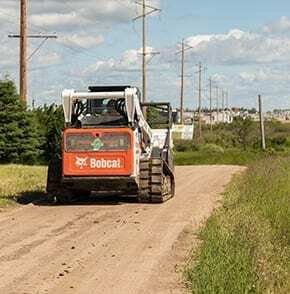 Driving 300 horses of multi-terrain mulchers through the scrub might be fun, but sometimes you'll need a little more finesse—which is where our professional tree service comes in. Maybe you have a 60-foot tree that is causing you anxiety, or getting in the way of power lines? We can use our new bucket truck to get to those large, overhanging branches or we can scale the tree to make sure that your home or work site stays safe. Contact us for your northern tree services needs in Alberta and Saskatchewan. 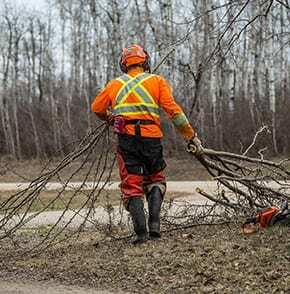 Tearing up a wooded area isn’t always a great look, so tree trimming services are an environmentally friendly alternative, allowing your company to keep treed areas free of safety hazards, keep branches out of power lines- all without causing permanent harm to the environment. 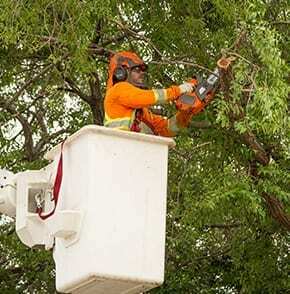 Our fast, professional tree services allow your company or town to create an appealing, safe and enjoyable area for everything from parks to corporate grounds. You tell us what to trim and we’ll do it for the right price, on time. If you’re redoing your yard or clearing up an acreage, tree trimming is a task that needs expensive equipment and specialist know-how–both of which we’ve got, neither of which you’re going to pay too much for.